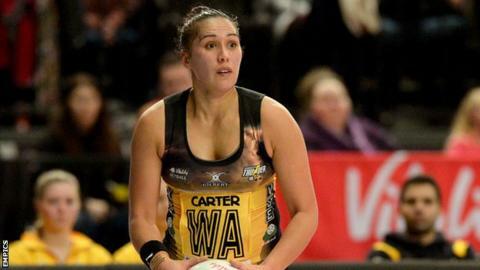 Manchester Thunder made it five wins out of five in the Superleague as they condemned Hertfordshire Mavericks to their first defeat of the season. The Thunder came from behind at half-time to win 57-48 away from home. Elsewhere, Loughborough Lightning beat Surrey Storm 55-54 and Celtic Dragons suffered their fifth straight loss with a 65-45 home defeat against Team Bath. Yorkshire Jets are the only other team without a win this season after losing 48-44 at Team Northumbria on Monday. The 2014 champions Thunder trailed 26-24 at the break, but started the third quarter strongly. A 12-5 burst saw them take the lead and they held on for the victory. All eight teams are back in action on Monday, with Thunder hosting reigning champions Surrey Storm and Hertfordshire travelling to five-time Superleague winners Team Bath.